Tonight’s chart shows the Polaris, the Big and Little Dippers for a September evening. Notice that a line from the two outermost stars in the bowl of the Big Dipper point to Polaris, the North Star. Also notice that Polaris marks the tip of the handle of the Little Dipper. The Big Dipper swings full circle (360 degrees) around Polaris in about 23 hours and 56 minutes. In 24 hours, the Big Dipper actually swings more than full circle, or 361 degrees. At the same time each evening, the Big Dipper appears just a little bit lower in the northwest evening sky. A month from now at mid evening, the Big Dipper will be noticeably lower in the northern sky, even sinking beneath the horizon as seen from the southern latitudes in the United States. The constant motion from night to night, of these stars circling Polaris, is a bit like a bear circling its prey, looking for a way to attack. Several ancient cultures from the Greeks and Romans to the Micmac Indians likened these stars to a bear. In Greek myth, the Big Dipper asterism represents the hindquarters and tail of the constellation Ursa Major, the Great Bear. The Micmacs saw the three stars of the Big Dipper handle as hunters chasing the bear. 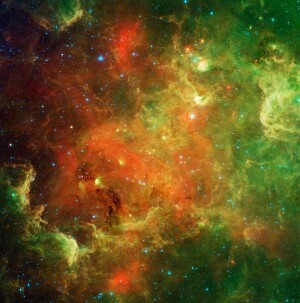 The northern sky is a large clock, with Polaris at its center. The hour hand is a line drawn through Dubhe and Merak, the two pointer stars of the Big Dipper. Because the stars make a full circle in 23 hours 56 minutes instead of exactly 24 hours, this star clock is not exactly the same as the one on the wall, but with a little practice you can learn to read it well. 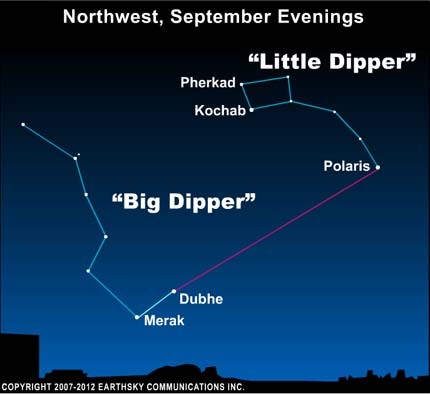 Watch the Big and Little Dippers circle around Polaris tonight!